Office 365 is the world’s most advanced collaboration platform. You wouldn't be alone if you feel like keeping up with these productivity-boosting features can feel like a full time job, so luckily you don't have to. Our goal is to help you realize its full potential and empower your teams to collaborate in modern and innovative ways. Your business is probably working toward adopting a digital workspace strategy to enhance collaboration between you and your co-workers. You demand simplicity as well as the ability to collaborate without having to have a deep technical expertise. Let’s look at the available workloads within Office 365 and how you can leverage them for collaboration. You will also want to check out our events page and attend our free Lunch & Learn for Office 365 Collaboration tools on September 13th. Delve is an employee profile and content discovery for easy collaboration, finding the right person and the right content at the right time. It acts as a tool to curate all your necessary business content in one place. Power BI is a business analytics software providing interactive visualizations with self-service business intelligence capabilities. End-users can create reports and dashboards by themselves without having to depend on information technology staff or database administrator. PowerBI empowers users to analyze various data sources and collaborate with various users/teams for effective decision-making. 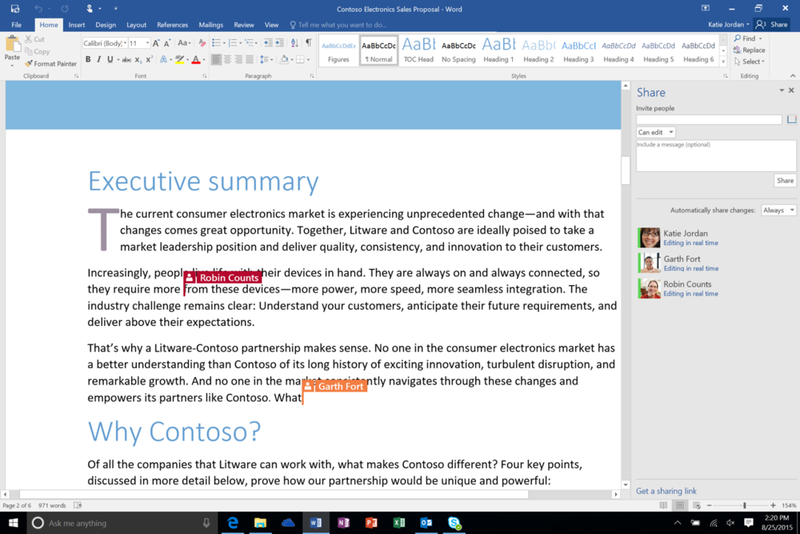 Office Online is the Office suite with enhanced collaboration. You can work with your team on presentations in PowerPoint or reports in Excel simultaneously using a mobile app, browser, or desktop-based Office suite. Office Online is version controlled and governed by the very same policies that manage Office 365. In PowerApps, you can manage organizational data by running an app that you created or that someone else created and shared with you. You can create an infinite variety of apps – all without learning a programming language such as C#. Combined with Flow, users can create compelling workflow-based applications without the complexity of writing custom code. Microsoft Flow is a service for automating workflow across the growing number of apps and SaaS services that business users rely on. Workflows are essential for effective collaboration. Timely notification and information about changes to content, people, and applications bring a workforce closer towards achieving common goals. Imagine having a workflow defined so that a new request for a proposal is published, and a set of predefined tasks for pre-sales, technology, and customer success team is created to effectively work on a response without bringing in redundancy. OneDrive for Business is an integral part of Office 365; it provides a place in the Cloud where you store, share, and sync your work files. You can update and share your files from any device with OneDrive for Business. You can also work on Office documents with others at the same time. It provides the much-needed ability to control your documents and content and share internally and externally at the same time with the right set of permissions. OneDrive provides sync client for desktop, mobile, and tablets with the selective sync option to optimize your storage and share your content effectively. Your users can modify the content in real time based on their access permissions. 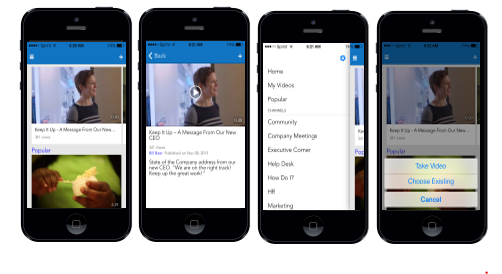 Office 365 Video is similar to YouTube, but for business. You can create multiple channels secured for access where users can tag people for easy findability. It is a new, dynamic video portal available to Office 365 customers. It enables easy uploading, sharing, and playback of video messages securely throughout your company. The portal is designed to meet the requirements of IT and win the hearts and minds of users. 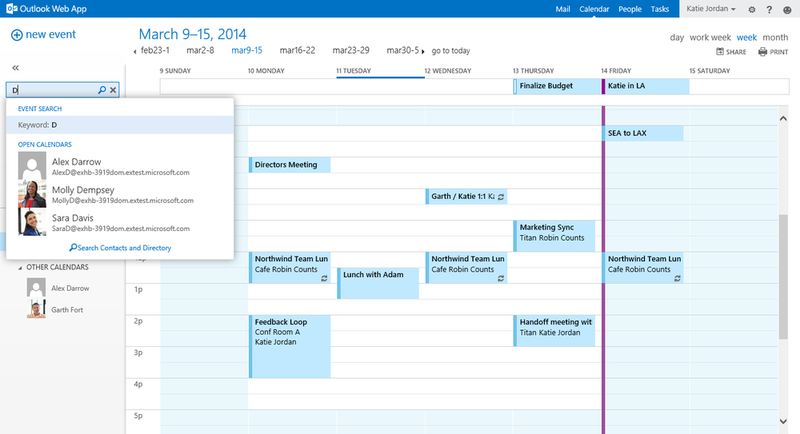 Your calendar in Outlook Web App allows you to create and track appointments and meetings. You can create multiple calendars, link to other people’s calendars, and even share your calendar with others in your organization. Web and desktop access to your integrated calendar provides full-featured web interface for accessing your calendar (Outlook Web App), as well as providing integrated calendar compatibility with desktop email clients, such as Microsoft Outlook and Apple Mail. It also allows you to access your email, calendar entries, and contacts from your mobile device. Planner is your everyday work management tool. With Planner, teams can create new plans; organize, assign and collaborate on tasks; set due dates; update statuses and share files, while visual dashboards and email notifications keep everyone informed on progress. Planner offers people a simple and highly visual way to organize teamwork. Planner makes it easy for your team to create new plans, organize and assign tasks, share files, chat about what you’re working on, and get updates on progress. Planner can be used to manage a marketing event, brainstorm new product ideas, track a school project, prepare for a customer visit, or just organize your team more effectively. Site mailboxes – A site mailbox is functionally comprised of a SharePoint site membership (owners and members), shared storage through an Exchange mailbox for email messages, and a SharePoint site to store and share. Public folders – Public folders are designed for shared access and provide an easy and effective way to collect, organize, and share information with other people in your workgroup or organization. Shared mailboxes – A shared mailbox is a mailbox that multiple designated users can access to read and send email messages and share a common calendar. Groups – Groups (also called distribution groups) are a collection of two or more recipients who appear in the shared address book. When an email message is sent to a group, it’s received by all members of the group. Skype for Business allows you to connect with coworkers or business partners in your company or around the world. Teams is the new chat-based workspace in Office 365. Microsoft Teams is an entirely new experience that brings people, conversations and content together—along with the tools that teams need—so they can easily collaborate to achieve more. It’s naturally integrated with the familiar Office applications, such as Skype for Business, Exchange, OneNote, Planner, Delve, and SharePoint and is built from the ground up on the Office 365 global, secure Cloud. Yammer provides a simple way for your team to collaborate, share knowledge, and engage everyone within your company. It leverages Office 365 groups, Delve, and seamless Office suite integration to effectively collaborate with internal and external stakeholders. Microsoft Office 365 Groups is a Cloud collaboration feature for communication, coordinating group efforts and sharing information. Office 365 Groups allows users to create and manage ad hoc “groups” for collaboration. The group provides members access to a shared inbox, calendar, and file repository.